Each year in Minnesota, Daylight Savings Time (DST) starts the second Sunday in March and we switch back to standard time the first Sunday in November. In March, we “spring ahead” and seem to lose an hour of time—in November we “fall back” and seem to gain an hour of time. The switch happens at 2am local time in both seasons. Not all states in the U.S. observe DST—Arizona and Hawaii don’t change the clocks. Ben Franklin is reported to have been among the first to suggest the concept. It started in the U.S. as a federal law in 1918, and gave states the choice to observe it. However, it wasn’t really put into practice until World War I, when it was suggested as a means to save energy. Many people think that DST was created to benefit farmers—in truth, the farming industry has actively lobbied against DST. The actual amount of energy saved has been questioned repeatedly over time. For example, if we use less electricity to light homes in the evening hours, does the use of air conditioning later into the evening cancel negatively impact any savings? During World War II, DST was mandatory for the whole country, as a way to save resources—and it was used year-round from 1942 through most of 1945. During the oil embargo from 1973-1974, the U.S. used DST year-round again. In 2005, the Energy Policy Act added a month to DST, starting in 2007 (bringing the end of DST to November, as it is today). Observance of DST varies around the world—whether it is used, and when the time changes. Medical studies have cited that the risk of having a heart attack increased in the days following the start of DST in the spring, and decreased in the days following the start of standard time in the fall. During DST, when there’s more sunshine time in the evening, people tend to be more active and spend more time outdoors. This also means that TV ratings often dip in March, shortly after DST begins. It usually takes about a week for our sleep-wake cycle (or circadian rhythm) to adjust. 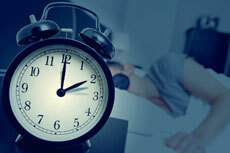 In the spring, try shifting your sleep routine gradually (by 10-15 minutes) a week before the change. In the fall, many people are tempted to use the extra hour as an excuse to sleep in longer—however, going to sleep and getting up at the same time can be helpful in making the long-term adjustment.